Kit Includes: (2)-9014020 12V DC Reloadable Battery Tubes and (1)-9018625 'Y'-Harness. Optional Wall mounting Tube Clips and EverReady Ultimate Lithium 'AA' Batteries can be added and selected below. Use this Reloadable Battery Tube Kit to replace the costly sealed Lithium Battery Wands. Simply remove screw off cap from the Aluminum Re-Loadable Battery Tube and replace with store bought batteries. Saves time and money! This Kit is for battery tubes that are arranged in a Side-by-Side configuration (See 'Detailed Images' below). 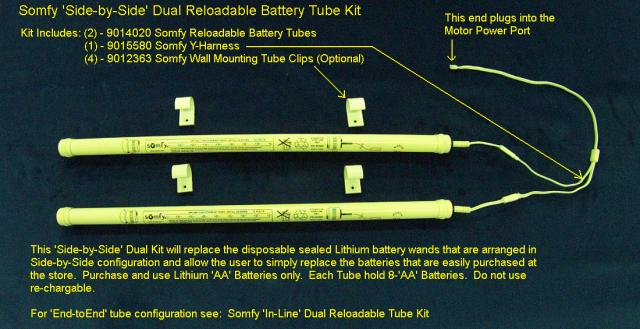 For End-to-End tube configuration, see 'In-Line' Reloadable Battery Tube Kit. Note: For older WireFree Motors like the LT30, CL32 and WireFree Tilt motors, choose the 10" Motor Lead Cable option if you do not already have one. If replacing the sealed Lithium battery wands you will need to order the 10" Motor Lead Cable when powering the older LT30, CL32 and WireFree Tilt motors.